Bvlgari known company introduced a new model of women’s jewelry watches Astrale, released in two versions: in the case of 18K white gold (Ref. AEW36D2CWL) and in the case of 18K rose gold (Ref. AEP36D2CWL). Novelty has an oval body with a diameter of 36 mm. 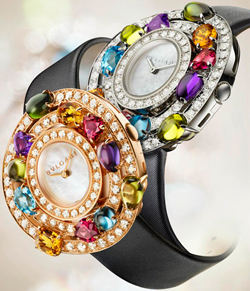 Model 66 is encrusted with diamonds and 11 colored stones – topaz, citrine, peridot, amethyst, tourmaline, rhodolite with sertsevidnoy, pear and brilliant cut. The winding head at position 3, gracefully “drowned” in the case. On a white mother of pearl dial is no markup. Time display performed by central arrows made of gold. The dial has a sapphire crystal. New Quartz movement operates on B033, provides an analog display of hours and minutes. Model Astrale satin strap equipped with a folding clasp in white or rose gold monogrammed Bvlgari. The new model Seamaster Aqua Terra GMT from company Omega!